In Patellar Dislocation, Lateralisation of the position of the tibial tubercle is one of the predisposing factors. We look at what the normal position is, how to measure lateralisation and what it looks like. The normal tibial tubercle lies roughly in line with the apex of the trochlear groove and the course of the patella tendon from the inferior pole of the patella to the insertion on the tibial tubercle is relatively vertical. Thus in knee flexion the patella stays relatively midline. 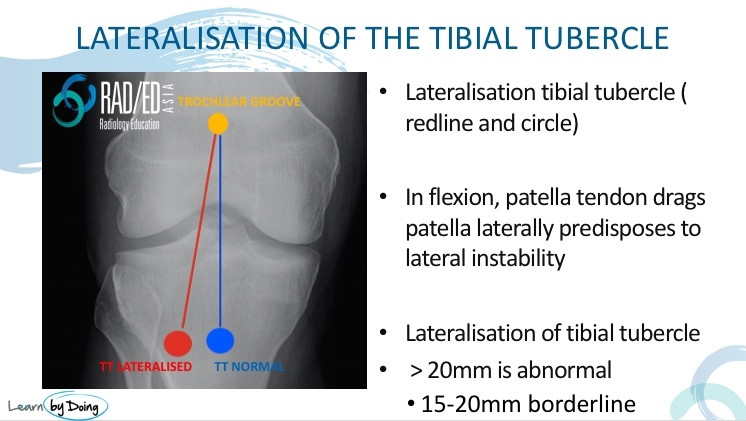 The tibial tuberosity can be more laterally placed and this results in a oblique course of the patella tendon with resultant increased lateral force on the patella in flexion. This results in increased risk of lateral patella subluxation. The measurements above are based on CT evaluation where the knee is in full extension. However in MRI with a knee coil the knee is about 15 degrees of flexion which results in some medialisation of the tibial tubercle. In MRI Normal is considered >15mm. The transverse distance between the trochlear groove and the tibial tuberosity is called the TT-TG distance ( Tibial Tuberosity Trochlear Groove distance). First line is through the apex of the deepest part of the trochlear groove ( Blue line). Alternate level is most proximal level of trochlear groove. The TTTG distance ( yellow line) is the distance between the first two lines. Place your cursor over the deepest part of the trochlear groove. Scroll down with the cursor not moving until you get to the patella tendon insertion. Measure the distance between where your cursor is and the centre point of the patella tendon at the attachment to the tibial tuberosity. What Does Lateralisation of the tubercle look like? 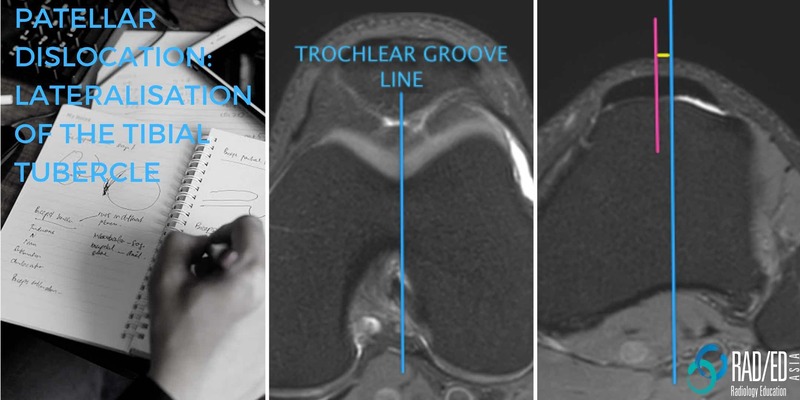 With lateralisation of the tibial tubercle, there is increased transverse distance between the centre of the trochlear groove and the central point of the patella tendon at its attachment to the tubercle. The TT-TG distance can vary between CT and MRI and also within MRIs depending on the position of the knee. The TT-TG distance increases at the end of extension. So if you use a body coil to scan the knee the knee will be fully extended and the TT-TG distance will be higher than if you use a dedicated knee coil where the knee is slightly in flexion. MRI will underestimate the TT-TG distance compared to CT as CT is done in full extension. ( See above for measurements on CT and MRI).